The Bicton Gardens near Budleigh Salterton, England were designed in 1735 by André Le Nôtre who had been a gardener to king Louis XIV at Versailles, France. 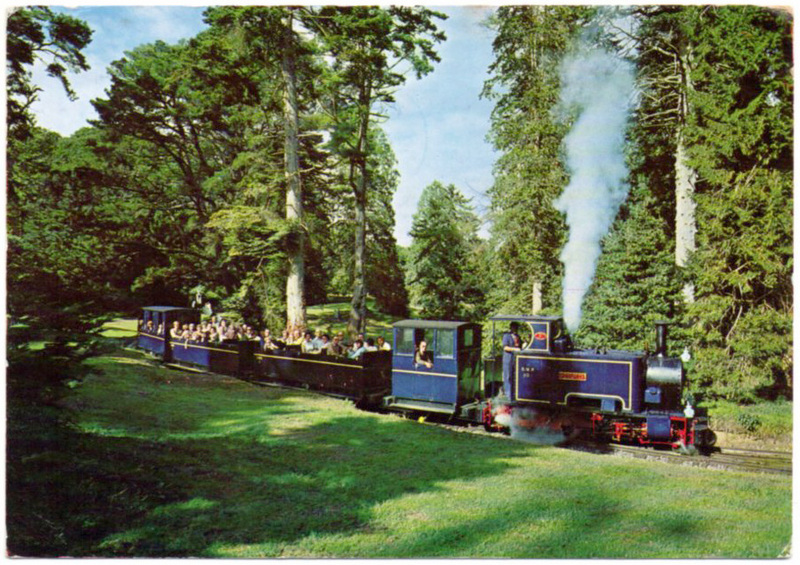 In the early 1960s the owner of Bicton Gardens wanted to open them to the public and decided to build a miniature railway as an additional attraction for the visitors. A very reasonable decision! The owner soon realised that acquiring a miniature 15 inch gauge locomotive would be too expensive. However, an 18 inch gauge locomotive ‘Woolwich’, formerly of the Royal Arsenal Railway at Woolwich, was available and in 1962 she was acquired for the line. Track laying started in May 1962 and proceeded quickly because by August 1,359 yards of track had been laid and the line was complete. Metal frames and bogies were acquired from the Royal Arsenal and used to create open and semi-open coaches. This rapid activity created what must have been a charming, if slightly incongruous, sight: a pleasure railway running through ornate gardens, headed by an 18 inch gauge industrial locomotive. This line has intrigued me and I’ve been buying old postcards and memorabilia online for several months now. 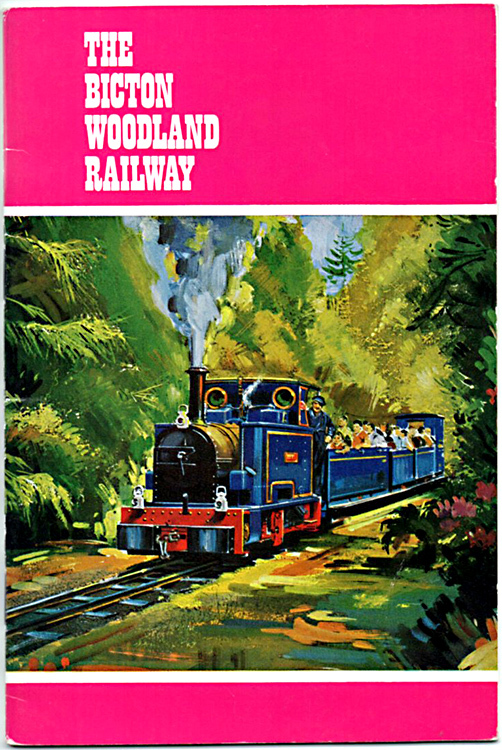 The Bicton Woodland Railway brochure at the beginning of this blog is an excellent history of the line. Dating from 1967 it contains descriptions of how the locos were acquired, photos of the building of the line and it tells me that ‘Draughtsman’s drawings’ of the locos at 1½ inch to the foot and ¾ inch to the foot could be purchased from the Gift Shop. Now that’s a shop designed for the railway enthusiast! ‘Woolwich’ was built by the Avonside Engine Company in 1916. She was oil fired and equipped with a spark-arresting funnel. 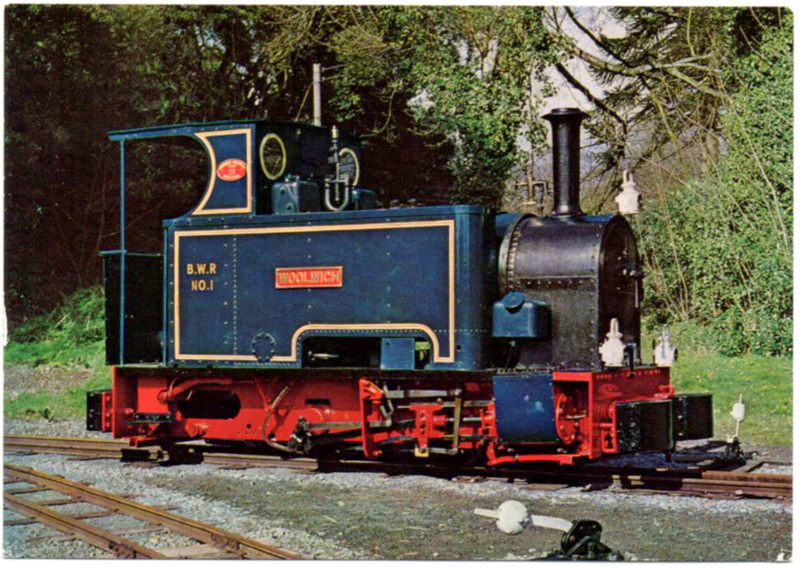 The brochure tells me that when the loco was purchased in 1962 the boiler was in excellent order and the loco may have been re-boilered recently. Apart from replacing the spark arrestor with a normal funnel, it seems few changes were made to ‘Woolwich’. 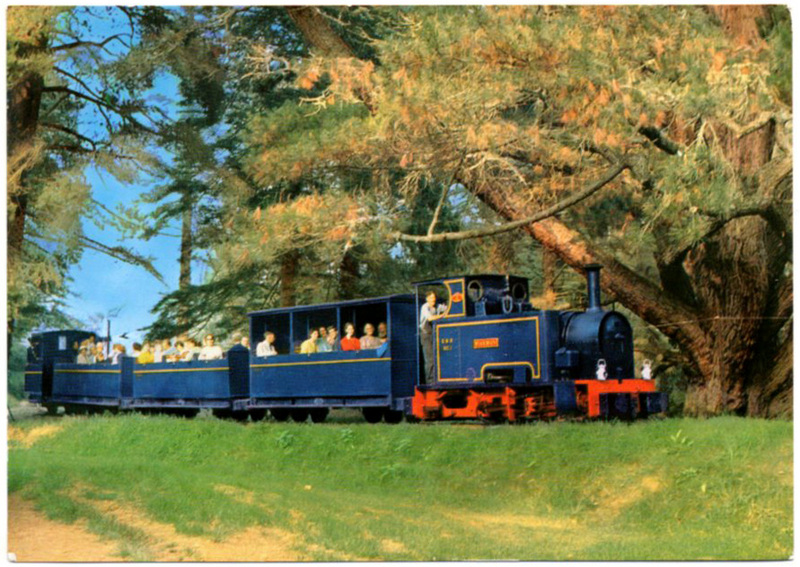 I have two postcards of the loco, one in lined livery (above) which is undated; and one showing her in unlined livery. Interestingly, this card is dated 13th August 1967, but the brochure published in 1967 shows ‘Woolwich’ in lined livery. Perhaps, an older postcard was available at the shop. The BWR produced these cute badges of ‘Woolwich’. It is only 3cm (1.2 inches) long yet it captures the character of the loco rather well. 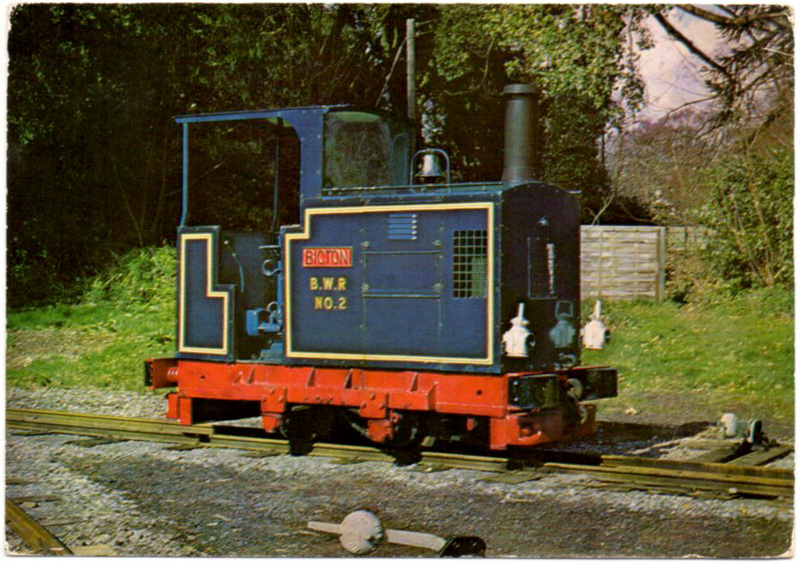 This little Ruston & Hornsby was loco Number 2. The brochure says it was supplied new to the War Department in 1942 for use at Lion Brickworks, near Melton Mowbray. It was sold to a 15 inch gauge line after the war but was never regauged. 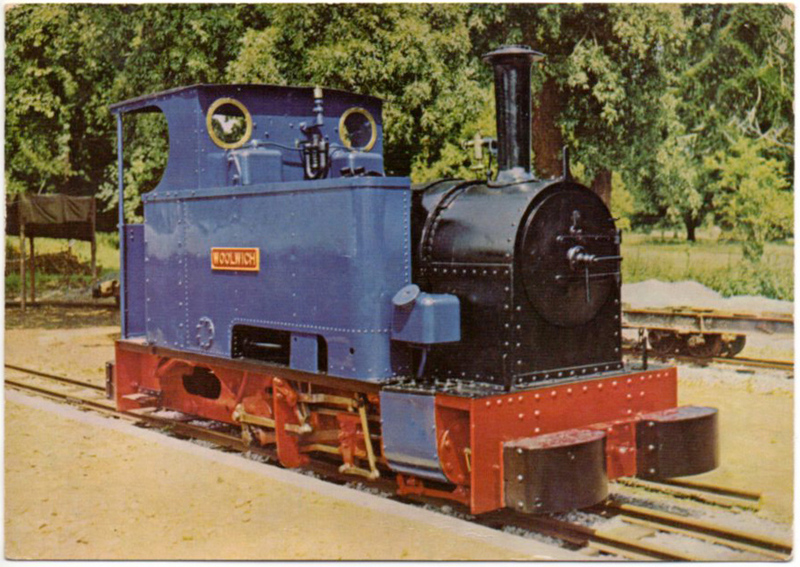 It was purchased in 1963 and named ‘Bicton’. 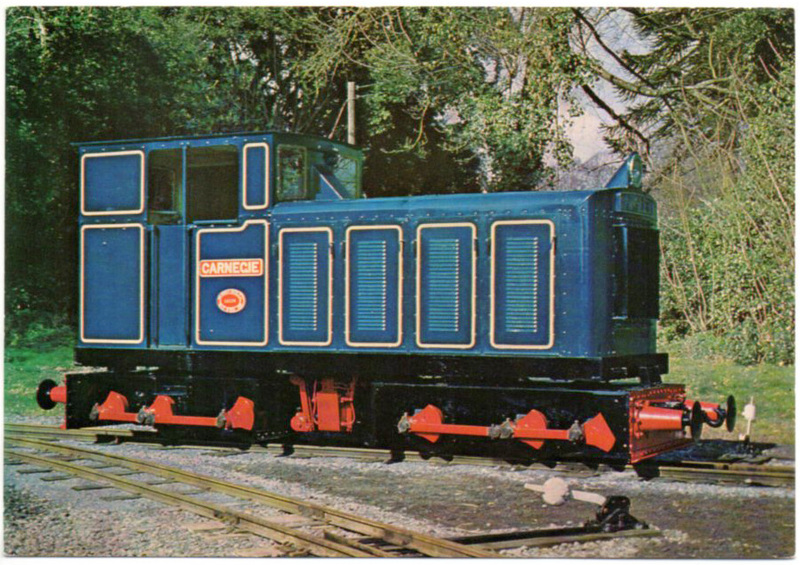 The third loco was another ex-Royal Arsenal Railway loco, ‘Carnegie’. Built in 1954 by the Hunslet Engine Company she is a powerful diesel articulated loco that could haul 375 tons on the level in first gear(!). She arrived in Bicton in February 1966 and entered operations that April. In 1999 ‘Woolwich’ was sold to the Waltham Abbey Royal Gunpowder Mills in Essex and in 2011 was transferred to the Crossness Engines Trust who have stripped the loco down to the frames as part of a major restoration project. I believe (but I’m not 100% certain) that the Crossness Engines Trust are interested in restoring ‘Carnegie’ too. 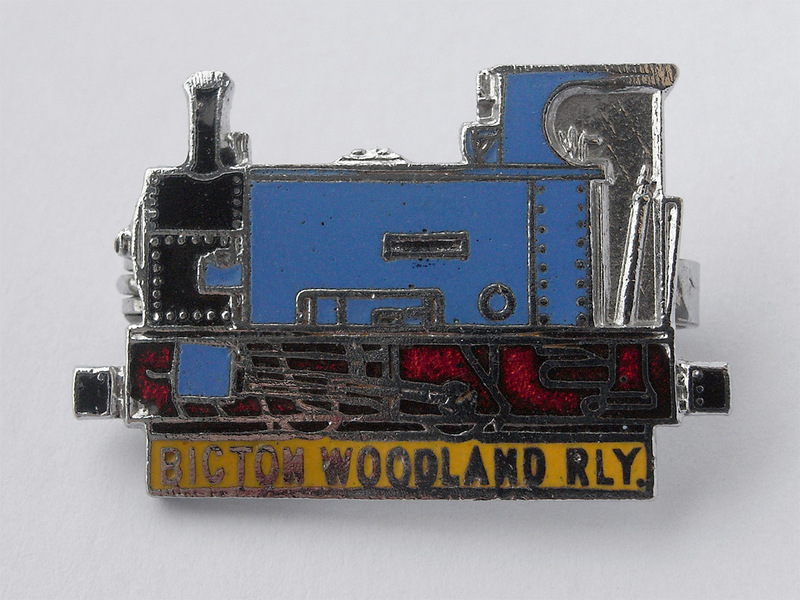 The Bicton Woodland Railway still exists. Today is operated by diesel, steam outline locos and, indeed, number 2 ‘Bicton’ has been rebuild as a steam outline loco. Obviously, this is more practical and cost effective but the romantic in me feels it is a shame that the ex-Royal Arsenal stock is no longer running at Bicton. Don’t forget Woolwich is available as a 4mm kit from Five79 (Chivers). Could be another layout on the go!! CUTE BUT HARD WORKING NARROW GAUGE!